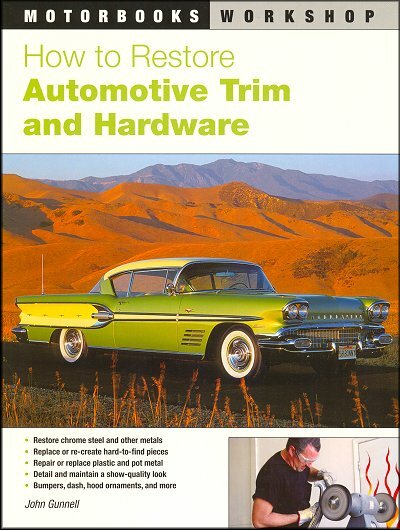 How to Restore Automotive Trim and Hardware: Restore Chrome Steel, Repair Plastic, etc. Little details can make a huge difference when it comes to a show car, and oftentimes, trim hardware such as moldings, emblems, gas caps and more, are ignored or neglected. However, with the help of How to Restore Automotive Trim and Hardware, any do-it-yourselfer will be able to bring those important little touches back to life and up to show-quality. You will learn how to restore chrome steel and other metals, how to recreate hard-to-find pieces, even repair plastic and pot metal. A must-have book for the serious restorer or anyone wanting to make their vehicle look their best! As we've seen so far, the system for restoring bright metal trim is quite simple: You hammer our dents, file the metal flat, sand it smooth, and buff it to make the metal lustrous again. We are going to keep going over and over this process throughout this book, using different chapters to show how to do each step like an expert. We can't do the steps with the trim still on the car. Dents are hammered out from the back side of the trim. You could possible sand portions of a molding while it is on the car, but it's not the way to do it right and you risk sanding off body paint. Likewise, you could do some on-the-car buffing with a small buff on a rotary tool, but it would be impossible to work the edges to give the piece uniform luster. To do a professional job of restoring trim, we have to remove it. There are several dangers in this, like the problem of damaging trim, especially if it's made of a soft metal like aluminum. Another big danger is breaking the hardware or pins that attach the trim to the car. Clips and bolts can grow weak from rust, while studs extending from the back of trim items such as name badges, are easy to break off. You can glue the badge on, but the best approach is to keep the studs intact. To remove body molding and other trim without damaging it or breaking the fasteners that hold it on requires knowledge and tools. If we know the properties of the metal in the piece we're removing, we have a good idea of how much prying it can take. If the trim is made of soft metal, we'll know it scratches easily, and we can take extra precautions to avoid hurting it. Along the same lines, if we get familiar with the design of the common clips and fasteners, we'll know how to take more of them off without breaking them. Ask a question about How to Restore Automotive Trim and Hardware.